After last year's actions where Animal Friends invited the citizens to adopt abandoned and wounded dogs, we continue the campaign trying to touch the citizens' sense for responsible care and adoption of wounded, unwanted and abandoned dogs. Animal Friends joins the action of the City Office for Agriculture and Forestry "A New Home for a New Beginning" which will be held on Saturday, May 6, 2006 from 9:45 A.M. to 1 P.M. at Ban Jelacic Square. 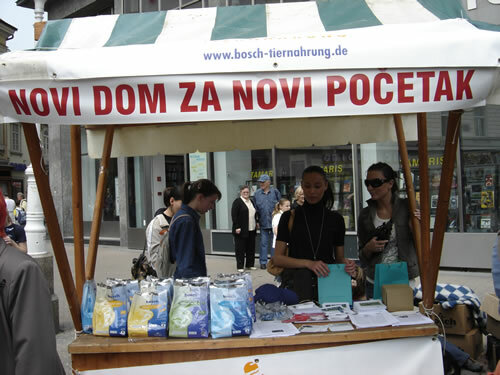 At the information stall, Animal Friends together with Zagreb Association of Animal Welfare Organizations and Futura, will invite the citizens, handing out educational material, to adopt abandoned animals from those associations and the city shelter for abandoned animals in Dumovec. This action will be supported by the mayor of Zagreb Mr. Milan Bandic, who will be present at the beginning at 9:45 A.M. Dogs will be presented to the citizens by Minea, Mirna Berend, Boris Mirkovic, Lana Klingor, Feminem, and Nikolina Pisek with the invitation to give them a new home. Shelters for abandoned animals should be the places for a temporary stay of the dogs, which will insure them adequate care and enable them adoption. Recent exposure of the dreadful and horrible conditions in which dogs live in the Karlovac shelter, where they will be killed after 30 days, show us the necessity, a humane responsibility, that animals should not be punished by being kept under terrible conditions and later death but to be insured by the law to have a safe stay in the shelter until adoption. Therefore a legislative proposal for animal protection is necessary to at one hand revoke the license to kill dogs after 30 days of stay in the shelter and on that the other hand districts and cities should determine the obligation of organized adoption of the animals as well as a spay/neuter program. Croatia needs a law for animal protection which will not approve the killing of abandoned animals, since Croatian citizens agree that their money should be spent on humane care of abandoned animals.